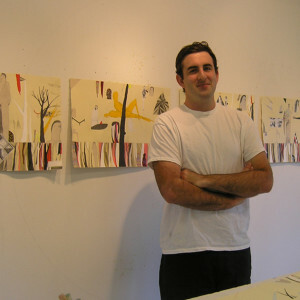 Joseph Hart refers to himself as a mixed media artist creating paintings and drawings with more than just paint. He collages distinctive marks with pieces of cut paper, paint chips, fabric, or his daughters stickers. Hart earned his B.F.A in 1999 from Rhode Island School of Design. His work has been shown across the US and has been reviewed in the Huffington Post and the New York Times. Hart works and lives in Brooklyn, NY.